Optimize your PowerShell scripts with loops when automating tasks that are repeated regularly and frequently. Microsoft has emphasized that the increased use of the PowerShell scripting language will make life easier for system managers. After all, maintaining and operating Windows systems means above all that many tasks need to be handled regularly and for a large number of computers. Just as robots tirelessly fit doors and windshields on assembly lines, small and not-so-small scripts can handle recurring work, such as creating users, monitoring processes, or installing software. Any programming or scripting language needs instructions the user can employ to design loops. It is irrelevant whether the language comes from the structured days of old or is one of the latest generation of object-oriented languages. 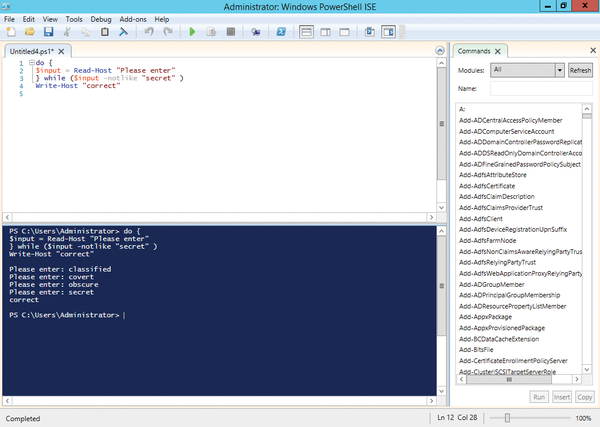 PowerShell would not be PowerShell if it did not offer several approaches and options for almost every task and requirement – including loop constructs. Beginners thus first need to struggle with the distinction between the for loop, the foreach construct, and the foreach-object cmdlet – not forgetting the do and while loops, which also can be interrupted as needed. The variable $count is initially assigned the value 1; then, a file named file1.txt is created in the h:\tmp directory with the help of the New-Item cmdlet; then, $count is incremented by one with $count++. The loop is executed as long as the value for $count remains less than five (-lt 5). Whereas the first call constantly returns 1, the second call outputs even numbers starting with 2. To drop out of these loops, you need to press the Ctrl+C keyboard shortcut. Even though this type of call initially might not look very useful, you will find such constructs time and time again in applications using shell scripts. When you run this code, the output appears on the screen far faster than with the first approach. In this case, the value is not stored in a variable by Get-Random on each iteration; instead, PowerShell takes care of creating and managing the array. At the end, the script outputs the results, which are stored in $table after the loop terminates. $names = "Hugo", "Emmy Lou", "William", "Frank", "Jane"
It lists the elements in a collection, which is often an array. We created a simple string array with five elements. The loop starts with the foreach keyword, followed by parentheses with three components: The first component is the variable, which the user specifically defined previously for this ForEach command. In the example, it is called $count, but of course you can choose the name freely, as long as you adhere to the PowerShell naming conventions. This variable contains the current element during each loop iteration, so it would contain the value Hugo on the first iteration and Emmy Lou during the second iteration. The second component within the parentheses is the in keyword, which always has to be used in exactly this way. Finally, the third component is the collection of values to be processed: It is represented by the variable $names. In this example, we called the Get-Service cmdlet in parentheses as the third component. It returns a collection of objects, in which one object is issued for each service on the local system. The loop is set up so that a service object is assigned to the $service variable at each pass. Inside the loop, the foreach statement then uses this variable to read the name of the service by using the name property of the service object. At the same time, explanatory text and a colon are appended to the name. In the next step, a property of the service object named canstop is read. This property returns a Boolean value indicating whether a service can be stopped once started. Finally, the foreach statement calls the tostring and toupper methods to convert this value into a string with uppercase characters. The order in which the two methods are used is important: The Boolean value first must be converted to a string with ToString before the ToUpper method can be used, because ToUpper can only be applied to strings. If you don't want to see the output of the Boolean value, False or True , in capital letters on the screen, you can leave out these two methods. With this script, too, the system services are shown on the screen (Figure 1). The Get-Service cmdlet pipes these to Where-Object (where), where a filter then finds objects that have the status "running." Where-Object then sends these results to a pipe, which is read by foreach-object. Figure 1: The ForEach-Object cmdlet can process objects directly from the pipe, which makes it very quick, especially with large volumes of data. The foreach-object has no code in parentheses – just a script block in curly brackets. If you choose this approach, you also do not need a separate run condition variable, as shown here, which is one distinction between the foreach-object cmdlet and the foreach statements previously presented. Instead, we used the fixed shell variable $_., with which we can then access the current value of each object in the pipe. The PowerShell ForEach-Object also provides an alias named foreach. Although this may be confusing in terms of the code, PowerShell has no problem distinguishing this alias from the "normal" foreach. Whenever a foreach appears in a pipe, you can be sure that it is an alias for ForEach-Object. Another difference lies in the way PowerShell handles the two calls: When the shell processes a foreach statement, it first creates the complete collection of objects in memory before it sets out to iterate through the loop. Therefore, it can take quite some time before processing begins if you have large collections. However, when the shell iterates through a foreach-object cmdlet, each object is processed as soon as it moves through the pipe (i.e., real-time processing). If you are an experienced programmer, you might be familiar with the terms "head-controlled" (or "count-controlled") and "foot-controlled" loops. Classic for loops that query a condition before entering the loop body are considered "head-controlled," whereas loop constructs that test a condition only after processing the instructions in the loop body are referred to as "foot-controlled." Thanks to this principle, it is guaranteed that a foot-controlled loop in the program sequence will run at least once, whatever happens. Figure 2: A loop that is processed at least once in the course of the program, the do-while loop only checks the run condition at the end of the loop body. This little program first opens a text file. The while condition tests whether the end-of-file ($file.EndOfStream) has been reached; the query is negated by the ! character, which stands for "not." If the end-of-file is reached, we exit the loop and use $file.close to close the file outside of the loop. 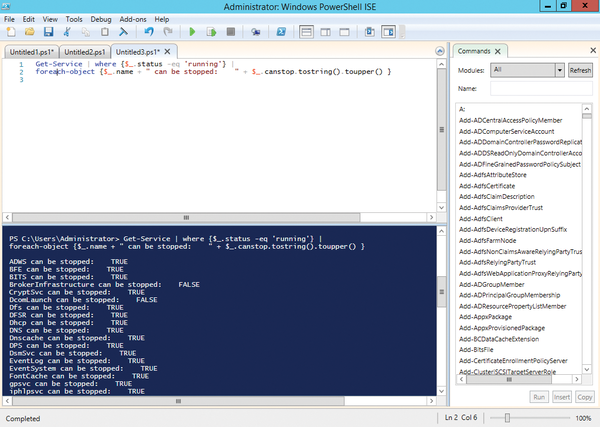 PowerShell’s ability to use loops extends its reach to remote systems and performs repetitive operations. We take a close look at the Exchange Management Shell – an essential tool for Exchange administrators. The software market offers numerous solutions for tracking the status of Windows computers. However, if you only need to monitor individual computers outside the domain, you can use PowerShell to collect basic health and performance data.